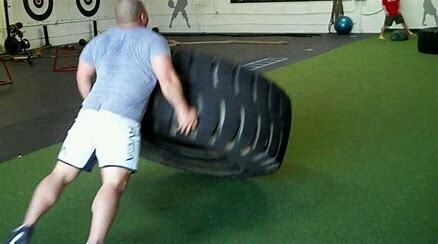 Tractor Tires at the Gym | "Northern Crossings"
I had a flashback the other day. It came about when I was watching an advertisement for something, I can’t remember what, but it had to do with men exercising in the background in what was obviously a well equipped exercise center. There were men in the background lifting large tractor tires and tipping them over and then repeating the process until they moved the tires across the exercise room. conflict with one another. There wasn’t any violence but it seemed like some might break out, especially when leaders of the groups saw that I had a camera and seemed to want to enlist me in whatever project they were engaged in. The proprietor yelled, “you might want to stay out that lot mate” in his South African accent and as I watched the procession a large truck pulled into the warehouse section of the store. So I went over there and watched a rather small wiry driver get out and open the back of his truck and begin to manhandle large tractor tires out of the back, roll them down the ramp inside, and by main force lift them and stack them in the spaces where they needed to go. It was obviously strenuous work and within a very few minutes this young man was completely covered in perspiration. He worked unceasing at that job for at least two hours. When he was done he came inside the store and the proprietor reached into the cashbox, and gave him what would be the equivalent in our money of about $1.75. I could’ve spent the rest of the afternoon trying to figure out what that amount of money would have meant to that young man in that country at that time. The amount of his labor, and the amount he received and what it meant to his family was beyond me. I remember giving a ten dollar tip to a waitress at one of the hotels we stayed at and was amazed at the amount of help and service she provided through out the day until one fellow told me my tip was approximately what her salary would be for about six months. All is relative I suppose. What brought the flashback to me what is the sight of these gentlemen inside a temperature controlled environment, moving tractor tires across a floor for exercise in a club in which they probably paid a couple of hundred dollars a month to be members is incongruous to me. me by he looked at me with a sense of pride in his face that told me he knew the value of work. The message from that commercial is still not clear to me, but as the old country gospel song says, “we’ll understand it all bye and bye”. PreviousIs There a “Mob” Mentality or are Mobs Just “Mental”?